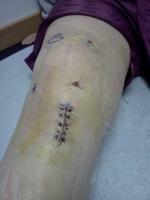 Is it possible for my 9 year old son to return to normal sport activities after having a moderate ACL tear. 4 weeks ago during a mini football game he had a knee injury. We took him to the ER and they did an x-ray and said he just had a sprain to wear the immobilizer for one week then follow up with pediatrician for a note to return to football. They assured us at the ER that he had no tear just a slight sprain. He had pain when it happened but that evening he was fine, walking, bending, he had very little swelling if any at all. One week passed & we took him to his pediatrician and he said no way will he give a note without an MRI. Well the MRI showed a moderate tear to the ACL. We took him to the orthopedic surgeon & he said to rehab at home with riding his bike or stationary bike. We have been doing both but I feel like we need more. He said if he can rehab it enough that he would be able to return to sports, possibly by spring for baseball season. Is there more that we can do to help make sure that he will be able to return to baseball & football??? I was told that he may be done with all sports until he is old enough to have ACL surgery maybe 13 or 14 years old. I thought you could not do surgery unless it is completely torn??? As you can tell I am very confused. My son lives to play sports and I spend every Sunday in tears as he stands on the sidelines of his football games and watches his younger brother play & his dad coach the team. He was the quarter back on his team and he injured his knee in overtime of a game, the play quarterback keeper, he ran out & went to cut up, took a small hit & he went down like he had been shot, before falling you can see his knee pull up. the video blows my mind because it didn't look bad at all.